You can depend on the Drexelbrook Dumpstar point level controls to help cut costs by increasing your operating efficiency by controlling water dump more precisely. Installing this level controller is easy and does not require the vessels to be empty. The electronic unit is integral with a retractable sensing element for simple insertion into existing block valves. 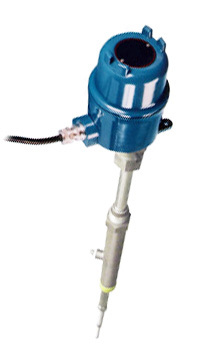 A retractable sensor will fit through a standard block valve with a minimum opening of a 7/8 inch. Cote Shield electronics ensure repeatable level indication regardless of temperature or density changes. To reduce repair and downtime the Dumpstar level controls come in a no-moving-parts design. The Dumpstar 506-6900 Series uses 406-6000 Electronics for Water Dump on Oil/Water Separators. Request more information to see how we can help you with a point level control solution that suits your need.